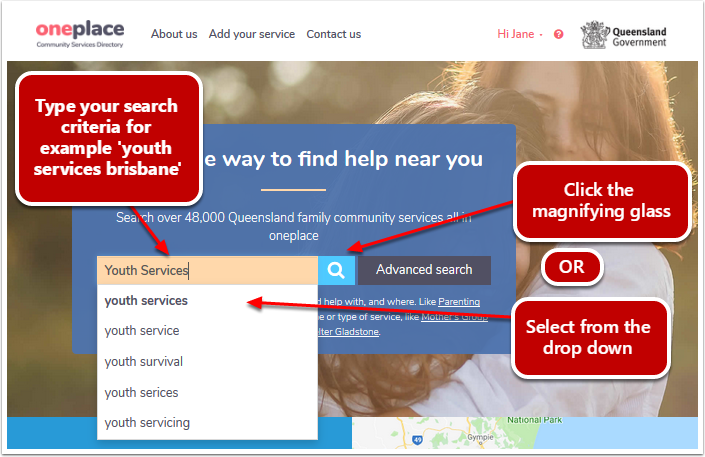 Learn how to search for a service using oneplace Community Services Directory community services directory. 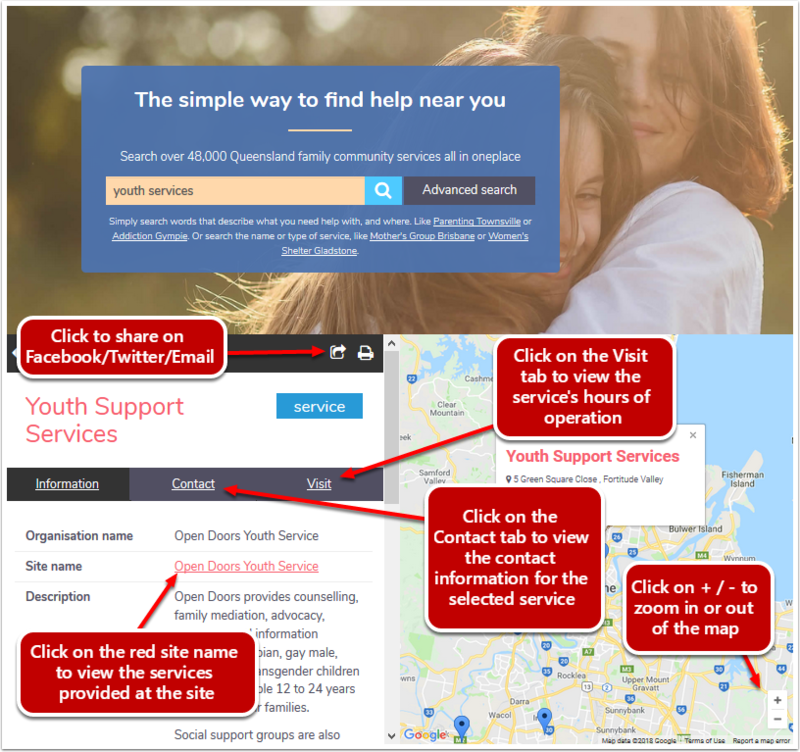 Enter any words or phrases to find local support services near you. 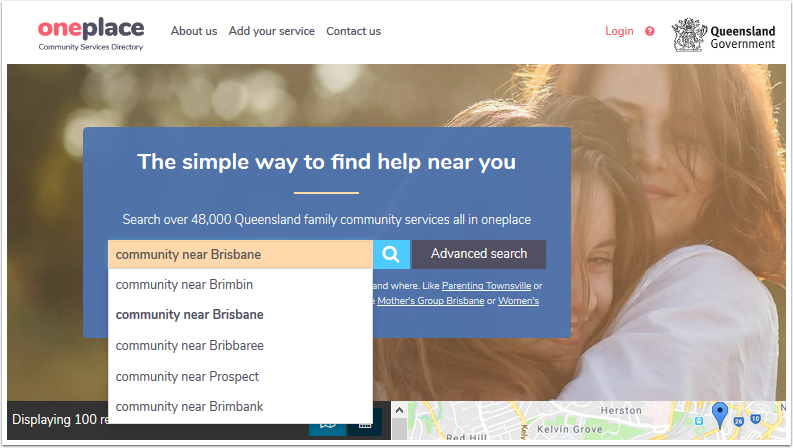 You can find local support services in locations by including the suburb or postcode in your search. Your results will be prioritised for relevance and proximity to you. The search engine will find exact words as well as synonyms for any search terms you type. The results of your search will be displayed in a list and will include a map with the exact location of services. Help lines relating to your search terms are always listed at the top of initial results in blue. You can select a suggested search by left-clicking the suggested result from the list. This will replace your original search term and load the results for the suggested search you selected. Or you can click the magnifying glass to the right of the search box to begin your search. The search results will be displayed on the map as clickable pins/markers. You can zoom in and out of the map using the +/- buttons or mouse wheel as well as move the map around. 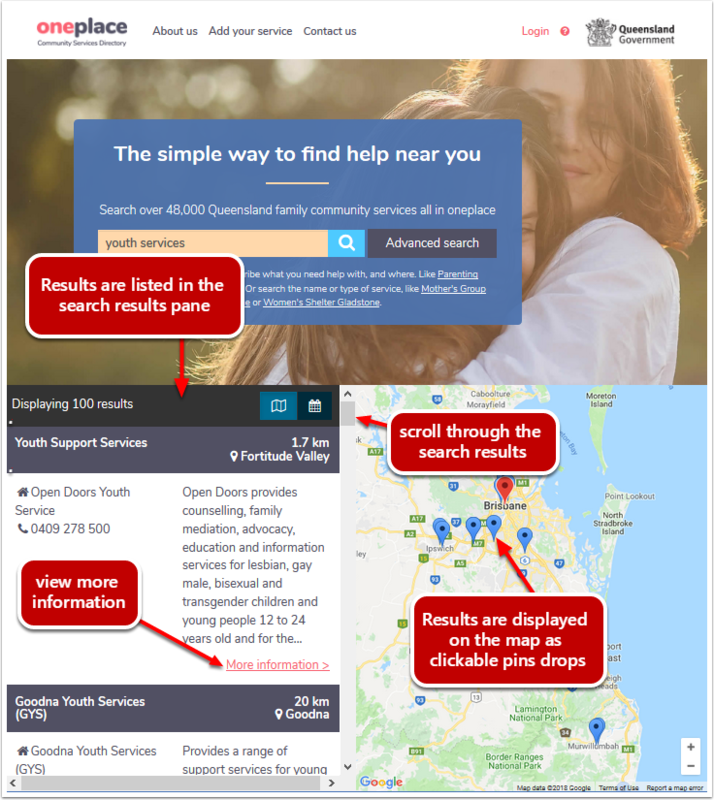 The details of the services and their locations will be listed in the search results pane to the left of the map. You can scroll through the search results and load more pages of results from the bottom of the search results pane. To view details from a selected service click the More information link. This will load the selected service's detailed information as shown below. When you click the More information link, you will be able to view the service's general information including a description of the service, languages spoken, and the type of service provided at this site. Click on the Contact tab to view the contact information for the selected service. Where provided this will list the service's telephone and fax numbers, email address, website, and street address. Click on the Visit tab to view the service's hours of operation. Where provided, this will list the service's street address and any other additional information provided by the services, such as parking information. To view all the services provided at the site, click on the red link next to the Site name. If you want to perform a quick search to find an event, enter the key words into the search field and click on the magnifying glass. Note: You have the option to narrow your search to events by using the advanced search button (see the advanced search section of this manual). The search results will be displayed in the search results pane to the left of the map. To view the events in the calendar, click on the calendar icon at the top right of the search results list. 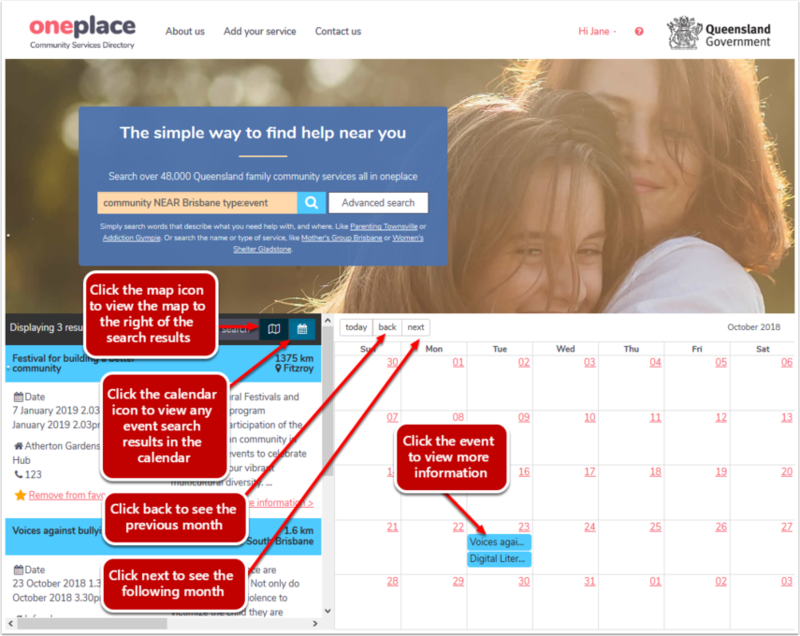 You can view the previous or next month by clicking on back or next at the top left of the calendar. 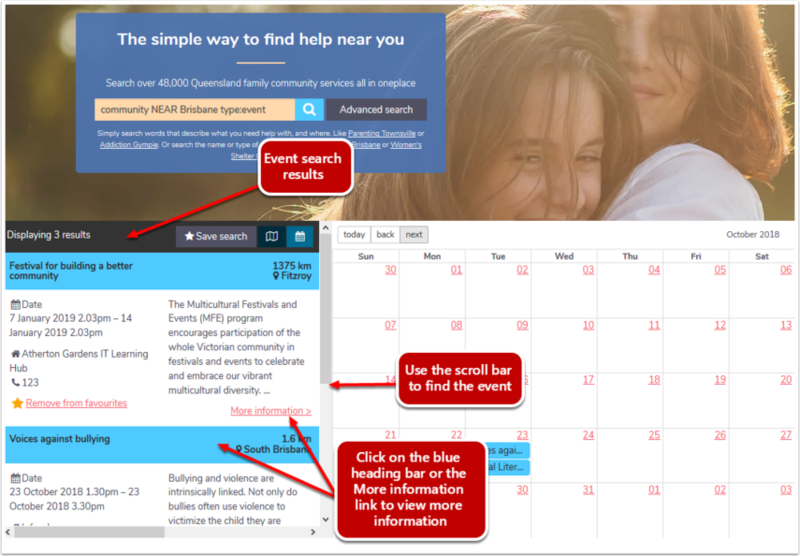 To view information about the event, click on the blue highlighted event in the calendar. To find an event in the search results pane, scroll down until you see a result listed in blue. All events are highlighted in blue with the event date and time. You can click on more information > to see more information about the event. 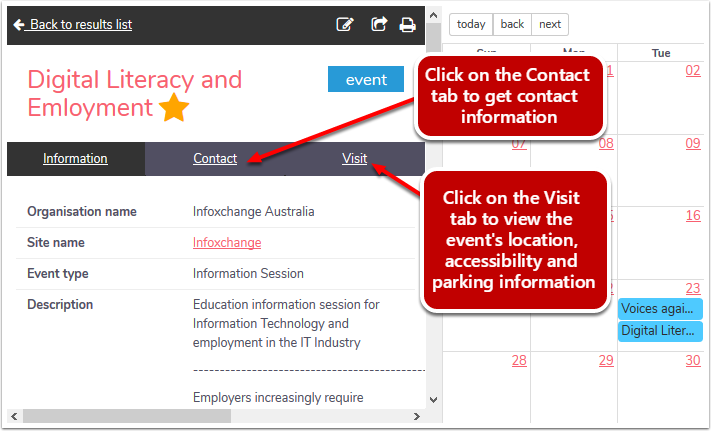 When viewing the event information, you can look at general information, contact details and visit by clicking on the inner tabs.